We deal in Canadian nightcrawlers. They are available from March through November. We offer you a choice of pre-packaged "dozen" containers or bulk by the flat (approximately 500 count). 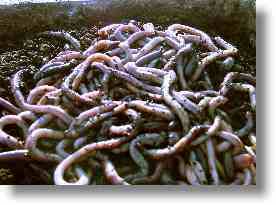 Our Angle worms are Minnesota grown. They come 24ct. in 8oz. styro cups "ready to sell"! If you prefer buying in bulk, we recommend you remove the crawlers from the flat and place them in bedding. We have bedding available if you need it. It's well worth using! If you're not ready to package the crawlers for resale at this time, put the re-bedded crawlers back into the flat and return them to your 35-40 degree cooler. Need bedding or cups? SAVE THE SHIPPING COSTS - we're coming right to your door with the rest of your order!